Preheat oven to 180°C (350°F). Line the base of 6 x ¾-cup-capacity (180ml) lightly greased round loose-bottomed cake tins with non-stick baking paper. Sift the flour and baking powder three times and set aside. Place the eggs, sugar and rosewater in an electric mixer and whisk on high speed for 12–15 minutes or until pale, thick and tripled in volume. Sift half the flour mixture over the egg mixture and using a large metal spoon, gently fold to combine. Repeat with the remaining flour. Add the butter and gently fold to combine. Divide the mixture between the tins and bake for 16–18 minutes or until the sponges are springy to the touch and come away from the sides of the tins. Remove the cakes from the tins and cool completely on wire racks covered with a tea towel. Place the cream, icing sugar and extra rosewater in a bowl and whisk until soft peaks form. 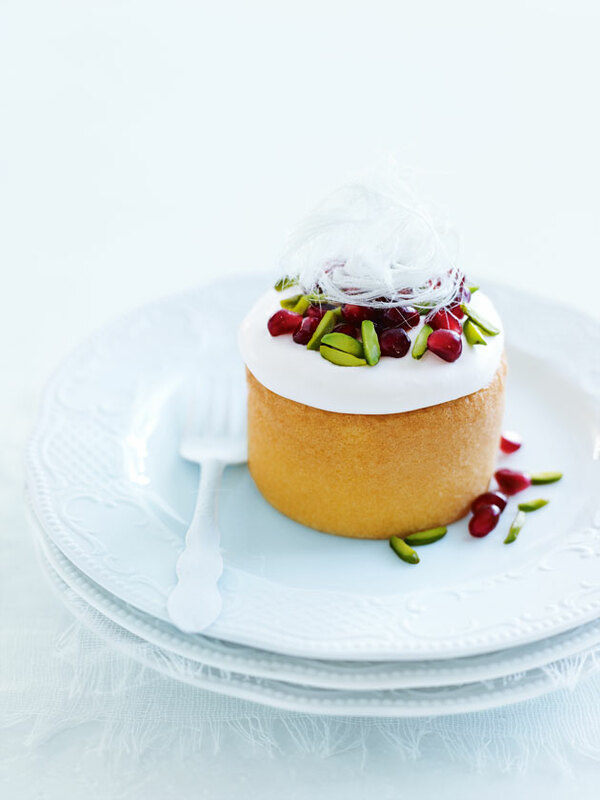 Divide the cream between the cakes and top with the pistachio, pomegranate and fairy floss to serve. Makes 6. + Persian fairy floss, or pashmak, is available from specialty food stores.